Take a thick bottomed pan. Heat half tea spoon ghee. Fry cashews and raisins and keep them aside. 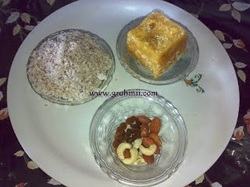 In the same ghee fry the grated coconut for 2 to 3 mins and add the grated jaggery to it. Slowly jaggery starts melting. Stir and cook in a medium flame. 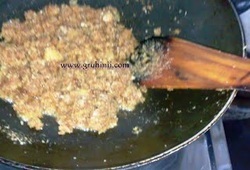 Cook until the mixture becomes thick. 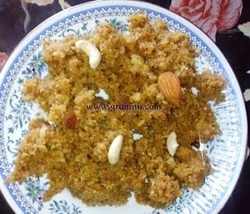 Add cardamom powder and dry fruits to it, mix well and switch off the flame.